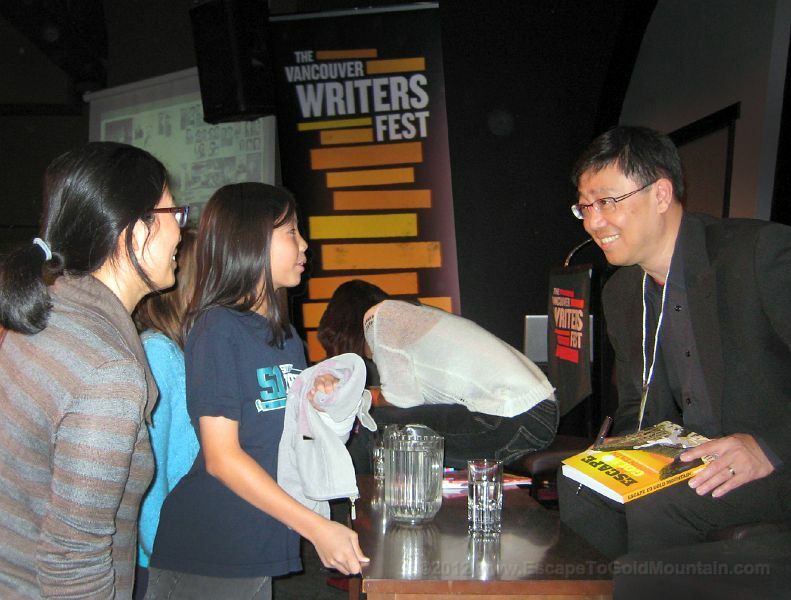 David Wong book signing with young admirers after reading at Vancouver International Writers' Festival on October 16, 2012. David Wong with Chinese Canadian Historical Society of British Columbia's Colleen McGuinness, Elwin Xie, and Hayne Wai (CCHSBC board of directors). Escape to Gold Mountain is the first graphic novel to tell the story of Chinese in North America based on historical documents and interviews with elders. ACWW's David Wong shares with the audience at the Vancouver International Writer's Festival this vivid history of the Chinese in their search for “Gold Mountain” (the Chinese colloquialism for North America) as seen through the eyes of the Wong family. They traverse the challenges of eking out an existence in their adopted homeland with hope and determination, creating a poignant immigrant’s legacy for their sons and daughters. What's next for author David Wong? Rumour has it that he's thinking about starting a sequel with friend and fellow author Jim Wong-Chu, so stay tuned!